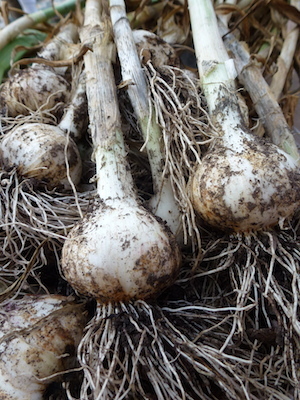 If you want to try your hand at growing garlic read my Hub Pages: How to grow and harvest garlic Look for garlic now to get the best selection. Order it now and it will be mailed to you at planting time. 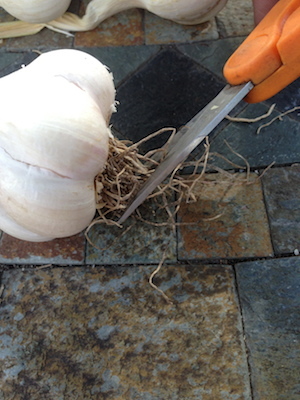 Don’t plant grocery store garlic. It may have been treated to discourage sprouting. 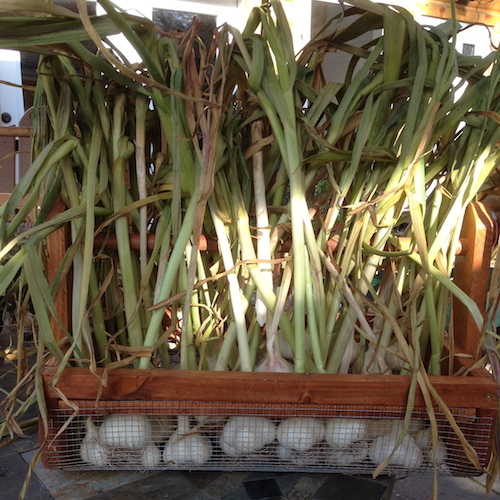 Purchase bulbs from mail order or online suppliers, garden center, or locally at farmers market. I am a herb gardener. Herbs are thriving in this summer heat. Since fresh tastes best. This is my version of Ranch Dressing. Use fresh herbs when you have them. Substitute Penzeys Fox Point seasoning for onions and garlic. Makes 1 pint. Keeps for a week in the fridge. Always shake before using. Note the expiration date on the buttermilk and let that date be your expiration for this Ranch Dressing. Always shake before using. If you use fat free yogurt instead of mayo, the dressing is still creamy and now low fat salad dressing. Try it. I prefer it with yogurt because you can not tell the difference. 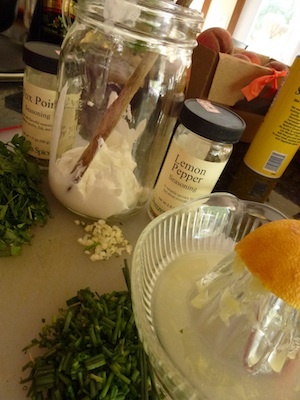 Mix ingredients in a bowl or jar. Use these dried herbs in winter or to make a gift mixes. Measure first five ingredients, minced onion, onion salt, garlic salt, onion powder and garlic powder, into a blender or food processor and blend until combined. Stir in parsley and dill. Store and keep mix dry. A Mason jar or freezer bag work well. Label and include instructions for dressing or dip. Label it. You think you will remember, but you won’t. Combine 2 Tablespoons dry mix, one cup plain Greek yogurt, lemon and one cup buttermilk. Allow flavors to blend for at least an hour in the fridge before using. The original recipe called for mayo instead of yogurt but I pinky swear you will not be able to tell the difference. If you make ranch chicken, ranch dip, ranch potatoes, ranch flavored oyster crackers or, ranch burgers, substitute this recipe for the packaged recipe with too much salt, msg, and other unpronounceable ingredients. 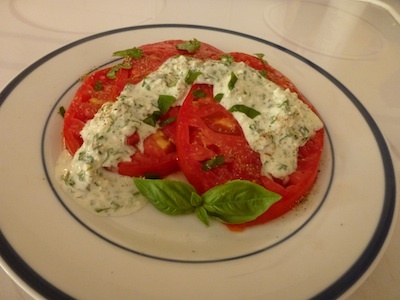 Sliced tomato with buttermilk dressing. At “pass the ranch.” give him your homemade version. There is no need to discuss that half the calories are missing, most of the salt and fat are gone. AFTER he says he likes it Then you can tell him. Bluecheese crumbles and chopped basil. photo PBH. Homemade Buttermilk Dressing with blue cheese and basil. 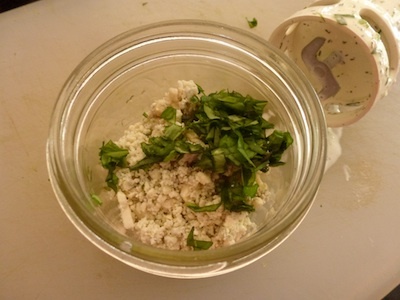 Start with 1/4 cup blue cheese and 1 tablespoon of basil. Taste, adjust cheese and herbs. Really, these are garlic chives. This is my story: After a lecture on herbs, the speaker said she had free samples of garlic chives for everyone. She had enough clumps to give to each of the 30 young and foolish beginning herb gardeners. She dug up these 30 fist fulls of garlic chives and wrapped them in plain newspaper to keep from getting our cars messy, she said. As I look back on this herbal exchange, I now believe the newspaper was meant to cover up the garlic chives. Sort of like the infamous plain brown wrapper. That way neighbors could not see what we were bringing into the neighborhoods. There would be no screaming or shouting or alerting the homeowners association plant police. 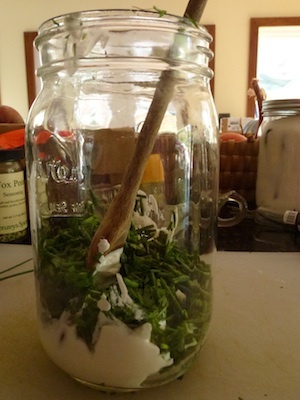 And it also provided a cover up so no one would know she was herb trafficking in garlic chives. To say that garlic chives are invasive, is an underestimate and should be punishable by law when people do not offer full dislosur. The plain truth is Chinese Chives are out to take over the world, one herb garden at a time. In fact, this is how I started out on the herb speaker’s bureau. I volunteer to speak to herb gardener wannabes. After the lecture, I pass out free samples of Chinese Chives to all the attendees and their friends and families too.